Kent “Bob” Gabourel of Team Kulture Megabytes’ rode in solo, a half mile ahead of his nearest rival as he dominated the A category of the Weekend Warriors Cycling Club’s “Sean Duncan” birthday race. 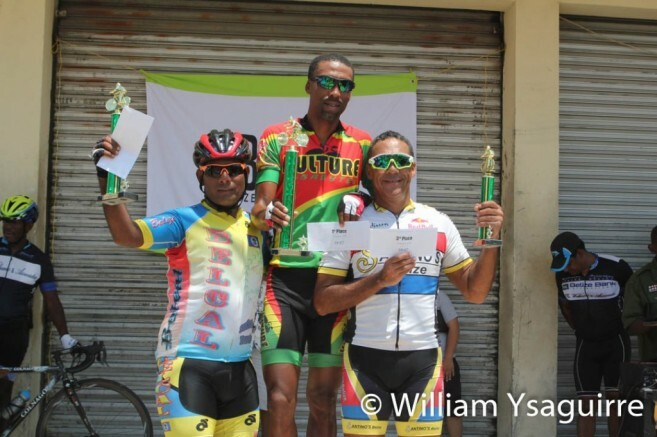 Sponsored by Belize Natural Energy on the Philip Goldson and George Price Highways to Belize City, the race was held on Sunday, March 19th. Sean Duncan and attorney Andrew Bennett, both of Team SMART Zoom, won the B and C categories respectively. A Category rode 60 miles from the Sand Hill junction with the old Northern Highway to Altun Ha and back to the Philip Goldson Highway, the via the Burrell Boom bypass to Hattieville on the George Price Highway, to finish at Leslie’s Imports.